- Purchased 1840 by Samuel Farrow. Reputed to have dated from 1600's. Carrier, Thomas Noble left every Friday morning for Thetford, as advertised 1830. Licence not renewed at the Diss Brewster Sessions held Tuesday 14th February 1906. Future of the licence to be determined at the Adjourned licensing Meeting to be held on Tuesday 6th March 1906. At the adjourned meeting held Wednesday 14th March 1906 it was said that 30 traps might be put up in the yard on market day. Five travellers could be provided with sleeping accommodation at one time. Motor drivers who could not be accommodated at the KINGS HEAD were sent to this house. Sales were 133 barrels of draught beer, 50 dozen bottles of beer and 59½ gallons of spirits. The last year had seen an increase of 9 barrels of beer and 10½ gallons of spirits. Licensee Harry Cattermole had served in the Coldstream Guards and attained the rank of Drill-sergeant. He retired on a pension in about 1901 and worked in London as a commissionaire. He relocated to Diss and took on the Star during the first full week of August 1913. He was taken ill two days after taking over and died on Wednesday 20th August. His funeral was attended by two colour-sergeants who had travelled from his old regiment, stationed in Aldershot. His bearers were four colour-sergeants and two sergeants from the Royal Norfolks. The representative for brewers Youngs, Crawshay & Youngs held the licence under a protection order and the licence was due to be transferred to Mr. Cattermole on Wednesday 27th August 1913. With the unfortunate death of the tenant soon after taking possession, the protection order was extended to Mr. Howlett. Application made by Mr. R. W. Eades of Youngs, Crawshay & Youngs, Thursday 10th March 1949 for removal to a new public house to be erected at Sunnyside, Diss. Outdoor manager for the brewery, Mr. Percy **Sheppard said the new premises would be a medium size house. The site was said to be in the vicinity of a factory, drill hall and a lot of allotments. The proposal was opposed by the Diss Council of Christian Churches and some local residents. A petition with about fifty signatures was presented. A retired brush maker, a postman and a Mr. Martin all supported the application. The police had no objections. The bench approved the plans and granted a provisional transfer of licence. The premises would be inspected and if found satisfactory, the licence would be permanent. ** Sheppard according to one report of the proceedings, Shepheard according to the Diss Express.. The Diss Express published a notification on 18th February 1949 that the application was to be made on 10th March, but that it was for removal of the licence held by Alice Hancey (widow) from the Star to premises then occupied by Edward Thompson Ltd. Final confirmation of licence removal given 13th July 1950. It was reported 1st September 1950 that the 4-500 year old building would be demolished along with the Old Corn Hall, in about three weeks time. The site intended to be a new Post Office. 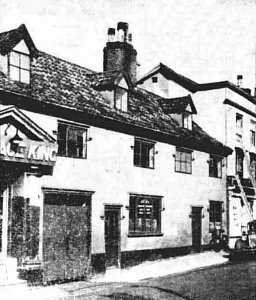 The Star described as one of the second class hotels of the town and used mainly for accommodating the servants of the Gentry who stayed at the KINGS HEAD. The frontage of the Star not being very imposing, but the house having a very large yard at the rear where, up to the late 1800's, used as a sales ground for pigs and other animals. "Diss is changing and must make way for the new, where the Star and Corn Hall once stood may be a modern multiple store or may perhaps be imposing business offices, one cannot yet tell. There will only be memories of an old inn where our forefathers did their business, sold their pigs, perhaps bought more and then paid a copper or so for a drink of real old English beer." See `A thousand thirsts : Memories of a market town pub'.